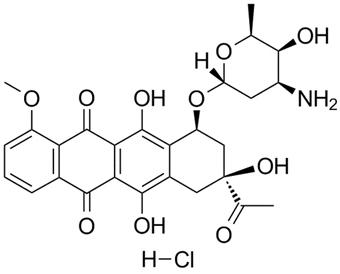 Daunorubicin hydrochloride is the hydrochloride salt of an anthracycline antineoplastic antibiotic with therapeutic effects similar to those of doxorubicin. Daunorubicin exhibits cytotoxic activity through topoisomerase-mediated interaction with DNA, thereby inhibiting DNA replication and repair and RNA and protein synthesis.
. Lehmann M, et al. Activity of topoisomerase inhibitors daunorubicin, idarubicin, and aclarubicin in the Drosophila Somatic Mutation and Recombination Test. Environ Mol Mutagen. 2004;43(4):250-7.